Gioseppo, a shoe and fashion accessory maker and distributor, has once again chosen a Mecalux storage solution to equip its Elche logistics centre (Spain). This is the second time Gioseppo and Mecalux have collaborated, after constructing an automated clad-rack warehouse with capacity for 5,844 pallets in 2008. In the next few months, the company will get a huge block of racks with built-in walkways installed, as well as a picking mezzanine, live pallet racks and some standard pallet racks. 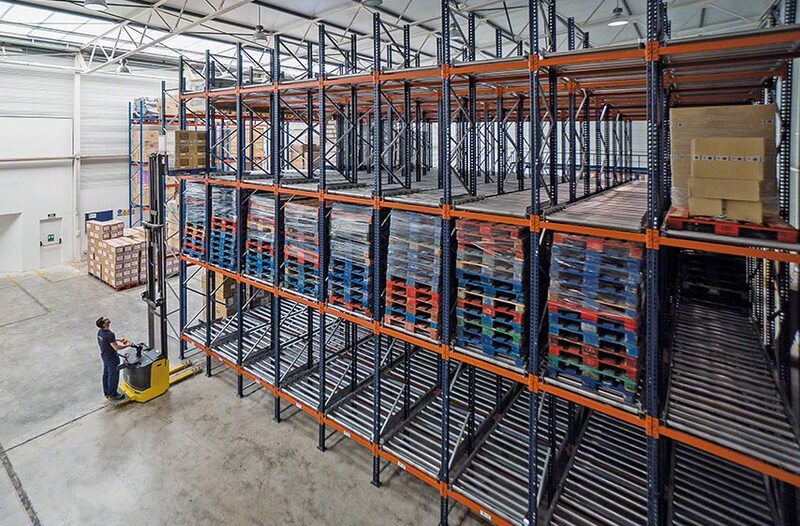 Both the racks with walkways and the mezzanine, with four access levels, will make full use of space at heights and will quadruple the available storage surface area. More than 480,000 boxes of shoes will be organised in the carton live storage shelves. Rounding out the provision will be the installation of five 10.5 m high pallet rack aisles and eight live pallet rack channels to accommodate a total of 1,100 pallets. Gioseppo, founded in 1991, is an Elche family business which designs and sells mid- to high-end shoes for men, women and children. After 28 years, Gioseppo currently produces three million pairs of shoes a year, operating in seventy countries through 5,000 retailer clients and more than 10,000 points of sale.